Here’s the latest piece from JasonW Studios®: the LaRoyal House Number Yard Stake! Designed to coordinate with the LaRoyal Address Wall Plaque, this yard stake is the embodiment of elegant outdoor decor. This stunning address marker pairs sophisticated design with a high-quality, USA-made construction. Crafted from precision-cut, 14-gauge steel, this address yard stake features ornate swirls and scrolls that serve as the background for raised, 4”H house numbers. This durable piece is outdoor-safe thanks to its powder coat finish and UV-, weather-, and tarnish-resistant properties. Select a house number yard stake that is most fitting for your home! Two finish options are available: a bronze base with gold numbers or a black base with silver numbers. Two size ranges are also offered: 1-3 numbers (20”Wx28”H) or 4-5 numbers (28”Wx28”H). 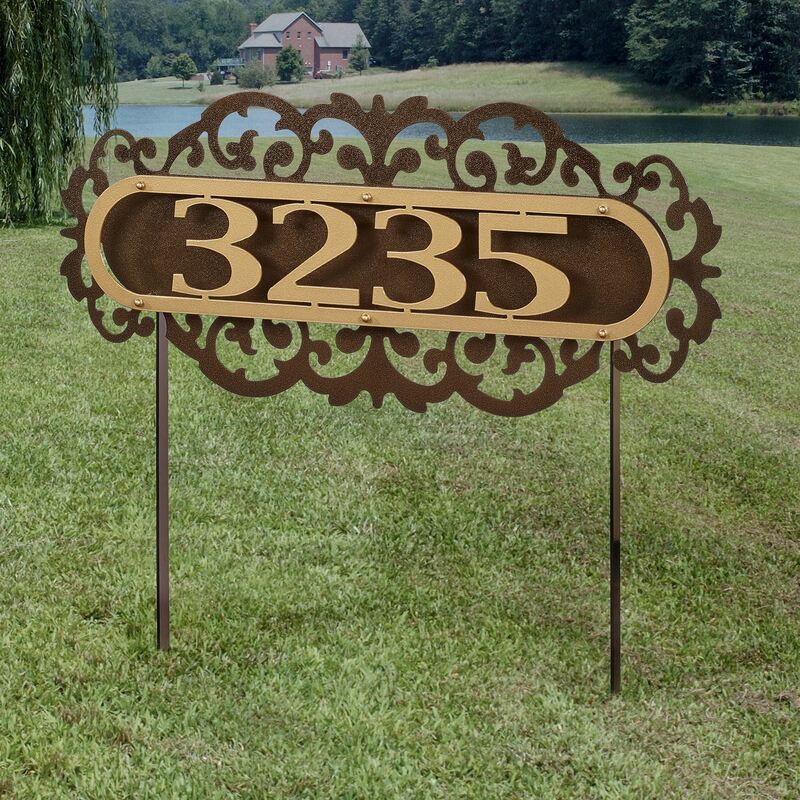 This handcrafted outdoor decoration displays numbers only; you’ll love adding it to your own yard or purchasing one for a personalized housewarming gift. Click here to view and order the LaRoyal House Number Yard Address Stake, an exclusive design from JasonW Studios®, available only at Touch of Class®.